The response to my earlier blogposts on Peter Reynolds has been spectacular, really. Over 400 unique people have read the homophobia article. 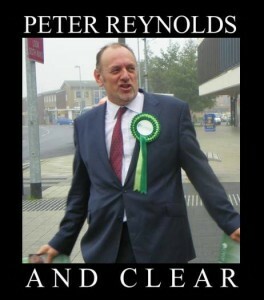 The response has been mainly positive, but there has been a persistent, and frankly, deluded trail of commenters who keep telling me and others that pointing out that Peter Reynolds is homophobic is a “distraction”, and “isn’t relevant”, that we need to “stay focussed” on the campaign and that Peter is “a damn good campaigner”. I can’t convince anyone who doesn’t believe that saying that gay people are infecting the fashion industry is a problem, but I can demonstrate the political sandstorm that awaits people who express such sentiments. Yesterday I received some very interesting news and screenshots to back them up – someone went through Peter Reynolds’ friends’ list on Facebook this week and contacted every single MP on his list, pointing out the comments on his blog. The result? The only MP contacted who hasn’t responded is Tom Brake, Liberal Democrat MP for Carshalton and Wallington – and he tried to ban cannabis seeds in 2008. Now, I can almost hear the complaint already that someone made trouble for Peter Reynolds by contacting all the politicians on his list , all the while missing the point – MPs are grown-ups, and actual politicians, and when they are made aware of people stating homophobic and racist reviews, they distance themselves as far and as fast as possible (except Tom Brake, apparently). 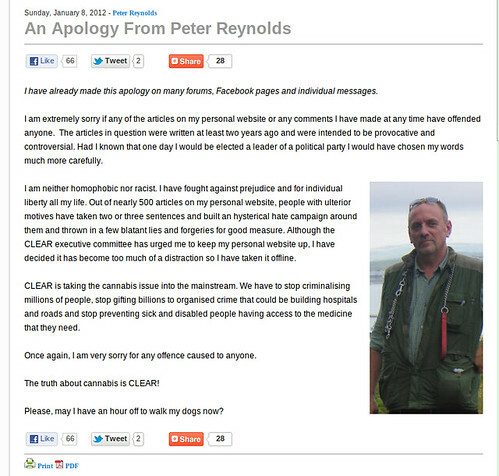 Saying that Peter Reynolds isn’t a homophobe because you have personally never seen him tell a gay person to their face that they are perverts, and claiming that no-one cares about what people post on their personal blog, is to have an exceptionally low opinion of the standing of the cannabis campaign and a belief that no-one is listening. But they are, and what they are hearing is that large number of cannabis campaigners are willing to set aside the basic human rights of a greater percentage of the population than themselves in the belief that Peter Reynolds can deliver them a bit of political influence. And I think you should question what impression YOU are giving of cannabis law reform, as well as Peter Reynolds. Maybe Peter Reynolds is influencing politics, but certainly not in the way we’d all like. 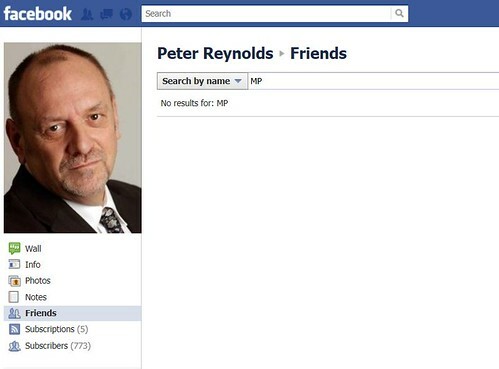 UPDATE: Michael Meacher, Labour MP for Oldham West and Royton has also deleted Peter Reynolds. UPDATE: Tom Harris, Labour MP for Glasgow South, has also deleted Peter Reynolds. 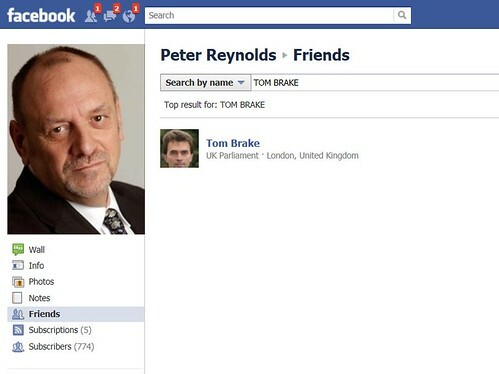 UPDATE: Tom Watson, Labour MP for West Bromwich East, has also deleted Peter Reynolds. FEBRUARY UPDATE: Tom Watson, Liberal Democrat MP for Carshalton and Wallington, has now also deleted Peter Reynolds. As has Bridget Phillipson, Labour MP for Houghton and Sunderland South. All MPs on Mr Reynolds friends list. If one part of your blog is incorrect then I dread to think what the rest of it is like..
Well, I did say that it was stuff that was sent to me. I have updated the article to remove the error. Also, just to note, Tony McNulty isn’t an MP anymore. Thank you Sarah. 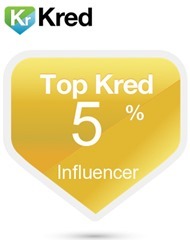 Its makes your blog more powerful if everything you publish is verified as true. I think that was called deflection Peter: Focussing on the tiny handful of MP’s who remain on your friend’s list while ignoring the 12 who have de-friended you. Tom Harris and Tom Watson have both deleted Peter Reynolds and the article has been updated with their screenshots. Great writing Sarah, really good article! THis is nothing but HATEFULL PROPAGANDER! Nobody givs a rats arse about Petres personal views cos he wants to legalise the weed! Those MPs are nothing but TROLLS AND TRUBBLEMAKERS! PEtre is too good for them anyways. Petre can say racist stuff cos he has a black friend which proves hes not racist. “Who on earth would post an article online calling gay fashion designers perverted fools? I have no idea why Sarah is being attacked for simply pointing out what the guy openly admits to writing. This is not a one off remark, but a series of damaging articles that will alienate minority groups from becoming involved in what is a righteous cause. If you are not just jerking off, report him to the police. You are no Judge, jury or executioner. This was written a week ago. How happy am I that my efforts in this regard, have been autonomous since eventually giving up i.v. heroin use in 1984? Appearing on Kilroy, BBC News, Sky News, BBC Wales, and a letter published in the Independent. Often on Radio5 Live. Seeing the frantic outrage, and feeling it, caused by recent events leaves me thinking:”Who would want to lead these people, and why?” We are all entitled to our opinions, as much as we are responsible for the consequences of expressing them. If only a fraction of the efforts undertaken to usurp Peter were directed positively. we would not now have tumble weeds drifting through our field of view. Those who would be judge, jury and executioner scare me, and not just for the future of the plant we allegedly all love. There appears to be more effort going in to organizing the hanging, than finding a resolution. I sense a return to autonomy, I would not relish either side covering my back. Good point, but Peter is causing all this, he should have done the right thing, stood by his writings and fell on his sword for the benefit of the political battle ahead. Comme on mate, how can he argue for us, they will tear him up, you cant express those kinda views and expect to get mainstream support. very unpleasant stuff – CLEAR’s reputation is rapidly falling into the same category as that of UKIP, BNP and the EDL – offensive, ignorant and irrelevant. I fully intend to take you to the cleaners over your lies and malicious falsehood. You and your idiotic cronies personify the reasons why the cause of drug law reform has advanced so slowly. You should apply to work for the Daily Mail. You’d fit in well there. Four and a half months in prison for ‘dishonesty’? Let’s face it, you’ve obviously got a track record on lies and falsehood yourself. “Well, I’ve met him and he’s definitely not homophobic or racist” seems a fair enough comment to make. Some people don’t get offended easily. Some people get offended very easily. Surely this stuff is relative? If you’re still upset maybe you’re a bit sensitive? As I said earlier some people are more easily offended than others. If for instance Derek says to Jayell “Watching you guys is like watching a pack of dogs all barking and snarling together.” Some people might decide that Derek was talking about them specifically and calling them a dog. Of course Derek was actually talking about bullying, which ironic given that people’s reactionary responses to harmless comments is quite often a result of bullying. He was making an analogy about a pack of dogs being similar to a pack of bullies. Peter’s blog comments however were intended to be controversial and offensive. How then might such intentionally offensive comments affect a person who is perhaps a little sensitive and reactionary? It would probably cause them to get very heated and morally outraged and start doing everything in their power to show people what an offensive monster the man was. Well, as I said before how offensive something is is relative. Everybody is different. Their are plenty of campaigns to end racism and homophobia and lots of people quick to get outraged on behalf of gays and lesbians or muslims and blacks but rather less support for people with big noses who get called “Bignose” or ginger people who get discriminated against or people who don’t have a learning problem like dyslexia or autism but who are nevertheless a bit dense and get teased for it. Ah! I see I’m priviliged and you’re marginalised. I’m derailing because I’m secretly biggoted! It’s all so clear at last! It’s easy to make a big list of every possible argument someone could make against somebody who’s having a big whiny tantrum and say it’s all derailing tactics. The fact is that some people ARE oversensitive or perhaps you don’t believe there even is such a thing? Where do you draw the line? If it’s alright to completely set out to defame and besmirch somebody’s character if you’re offended by them and do your level best to ruin their career why not go the whole hog and shoot them? After all he offended you and nobody could claim you were being hostile or overemotional or oversensitive because if they did they would just be derailing and anyway they’re probably priviliged. How many of the worlds dictators and tyrants are I wonder just bitter little people who were somewhat reactionary and a bit oversensitive and felt that because they’d been marginalised they would take whatever petty revenge on the world that they could? It’s even easier to just post a link up to that list. Peter said he was ‘extremely sorry’ and then continued to behave in exactly the same way. How ‘sorry’ do you think he really is? I met him briefly some months ago. He’s obviously an extremely intelligent and articulate man. There are several clips on YouTube and no evidence of anything else. On the evidence available, he would appear to be a first class (self) publicist and copy writer. However, even Hitler was nice to his dog. He’s a politician and proven liar with a conviction for dishonesty. He also spent three months on remand for beating up his girlfriend before the charges were apparently dropped. Given the homophobic and sexist nature of his rant about Sarah, I think it’s reasonable for him to say more about that. If Peter Reynolds were claiming he wanted to advance into politics to make the world a more balanced place for everyone then his statements would most definitely be relevant. As it stands, they aren’t. He isn’t claiming he wants to do anything other than legalise cannabis. As someone that suffers from fybromyalgia this is a pretty important topic to me. I’m not saying it’s acceptable to call any group names or attack their life choices, I’m saying that’s not part of his campaign. I support Peter Reynolds for what he’s trying to do politically, not what he’s saying that may be construed as racist, homophobic or having any other bigoted opinion. Hey. This sites got a good selection of Water Pipes for sale. They’ll ship your piece nearly anywhere for only $5 too, they’ve got a few custom pieces too that I’m sure you’ll like. Check em out. Peace!